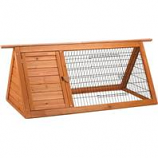 • Rabbit Home With 2-Piece Base Provides Your Pet Rabbit With A Full 8 Square Feet Of Living Space! 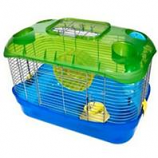 Perfect combination of cage and playpen 7square feet of living space. For rabbits guinea pigs and ferrets. Designed to be easily moved around the yard. For indoor or outdoor use.. Wire floor is perfect for use in yard..